By far, my favorite childhood toys were Masters of the Universe. I had almost every product from the original 1980s line, save for maybe a handful of figures and the big Eternia playset (now that I have kids of my own and see how much some of these bigger toy sets cost, I understand why I never got that one). I watched the cartoon religiously and my 8-year-old self thought the silly 1987 live action movie was awesome. I still do, if I'm being honest. Every action figure came with a small comic book that, more often than not, told some kind of story that included the just-purchased character. Collecting these and keeping them in their own secure little location became just as important to me as remembering which accessories went with each toy. Unfortunately, some of them became misplaced over the years, just as a lot of the figures and trinkets slowly began to become separated in moves and packing and re-packing. There came a point for me when wishing for all the mini comics became a bigger deal than trying to locate the toys that I lost, or even trying to secure DVDs of the old cartoon. Those stories were my real treasured entry point into the world of He-Man and his friends and enemies, and missing them was my real tragedy. 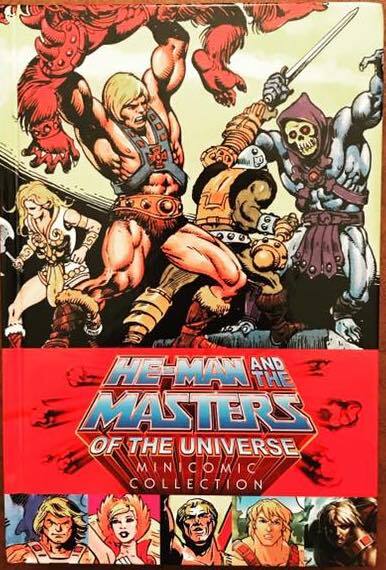 Two things changed that recently: getting some Amazon gift cards for Christmas, and discovering that a volume had been produced a few years ago containing every MOTU-related comic. I received it in early January, and devoured it in a few days. As I get older, I can appreciate the power of nostalgia more than I could before. Those years of sitting on the carpet having Skeletor attack Castle Greyskull or sitting on my bed leafing through my mini-comics are getting further away. And there's a part of me that always seems to be chasing what those years felt like, even as I'm doing my best to balance a career and a family, to say nothing of personal health, home maintenance, and all those other lovely things that come with something that resembles responsible adulthood. Every person can name what they're still chasing, and it might be something other than the feeling that came with playing with a favorite toy. It could be wishing for one last trip to a favorite vacation spot they used to visit with family. It could be one more conversation with a loved one. It could be some sort of artistic dream given up for the sake of a job. It could be wishing for some former era--whitewashed by time and memory--to return when everything seemed better. And because I'm familiar with this as a pastor, it could be longing for a time when the church was the main game in town and the sanctuary was full. Nostalgia can be powerful. It can be comforting. It can also be deceptive. Maybe indulging in it in small increments can be healthy, but living in it can be damaging. Maybe we find a way to have another shot at a lost dream. Maybe we find ways to make peace with what was while living into what is. I flip open my new mini-comic book for a few minutes, then I put it down to load the dishwasher or send a work email. Chasing what used to be in short bursts seems to work for me, with some mix of realism, sadness, and reclaimed joy. But whatever that joy can still give me, I'll take it. And I'll keep going back for more.